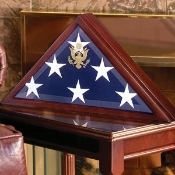 Retirement Flag Display Case Flags Connections understands how important it is to honor our loved ones, especially when they retire, and if you are looking for Military retirement flag display cases, you have come to the right place. 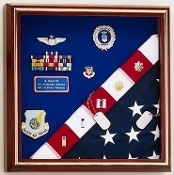 We have a huge selection of Military retirement gifts including Flag and photo displays for retirement and Retirement flag frames. Order an American retirement flag case like a flag and document case, or a flag and medal case. All of our cases are handcrafted using oak, walnut, red oak and cherry wood. The USCG Flag and medal display frame is designed to resemble the red, white, and blue stripes of the Coast Guard Cutter along with the boat flag. 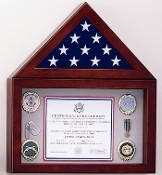 Decorated vets will be able to display their flags and medals in the Flag Display Case Combo Awards and Shadow Box. Designed for the Army, Navy, Air Force, Marines, Coast Guard, or firefighters and police. Order Flag and document for retirement party. Just imagine the look on your retirees face when you present them with Flag and photo displays for retirement. The Flag Frames with stand have a beautiful cherry finish and come with a pedestal making it easy to display on a wall or shelf. 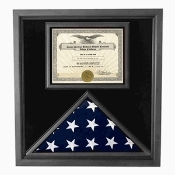 The perfect American service person retirement gift could be a flag and document case for those who have served in the fire department or on the police department. The Police Flag and Medal Display Case is large enough to include service awards, medals, documents and of course, a flag. This wood flag frame and stand can sit on a shelf or proudly displayed on a wall. The Police Flag and Medal Display Case also make a wonderful memorial display to honor a fallen hero. 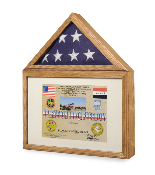 The best way to show how proud you are of a friend or family member is with a Retirement flag shadowbox. 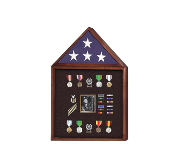 The 3 Bay Mantle Military Shadow Box is the perfect size and has ample room for memorabilia. 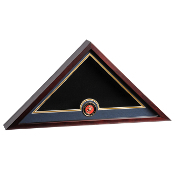 Available in walnut, or red oak, the shadow box also comes with a black, red, blue, or green background. Flags Connections has Retirement Flag Cases for all armed services. 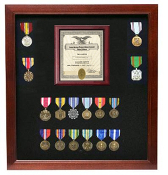 Show off the American Flag and medals in one case available in solid oak or walnut. The velvet background comes in red, green, blue, or black. You can even order a 3’ x 5’ or a 5’ x 9.5’ burial flag. 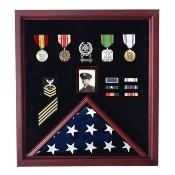 Start planning your retirement party today and get military and service display cases from Flags Connections.